Heavenly soy-based scents inspired by classic birthstones, for your gem of a friend. Birthday candles make one moment more magical. 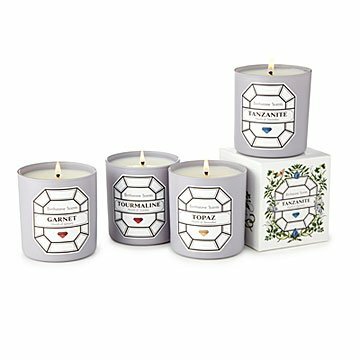 Birthstone candles? They'll make any moment more magical, even if it's just a bath on Tuesday. Each heavenly soy-based scent is inspired by a classic birthstone: August's peridot comes through in wafts of jasmine and lily, while February's amethyst is a soothing blend of lavender and sage. They're packaged in elegant floral boxes, so give one to the friend who's a real gem. Hand-poured in Los Angeles. 3.5" L x 3" dia. I gave this candle as a gift to my cousin for her birthday. It was nice to be able to add the personal touch with the birth stone. The smell was seasonally appropriate and fit in perfectly with her other decorative candles!